As a team, we always enjoy looking back at our past work. It allows us a chance to see where we excelled, and where we may need to improve. This year, we did this exercise a little differently. Each photographer chose one of their favorite photos from 2018- one that told a story. We’re sharing those photos and the stories behind them here. Enjoy! Abby and Matthew. Hotel Monaco. August 11, 2018. I’ve worked in this room many times over the years so I’m very familiar with the lighting and where to create great images in this setting. The bride wanted to have a special moment with her dad as their relationship is very close. I knew this was going to happen and had seen it before with other weddings, so I was ready to document it. As her father walked in, I caught the moment between her and her dad in one photo. As I continued to shoot, I took two steps to the left and saw a few of the bridesmaids peeking out. I had never seen it come together in quite this magical way before, so when I saw it, I was shooting frantically to get it just right. 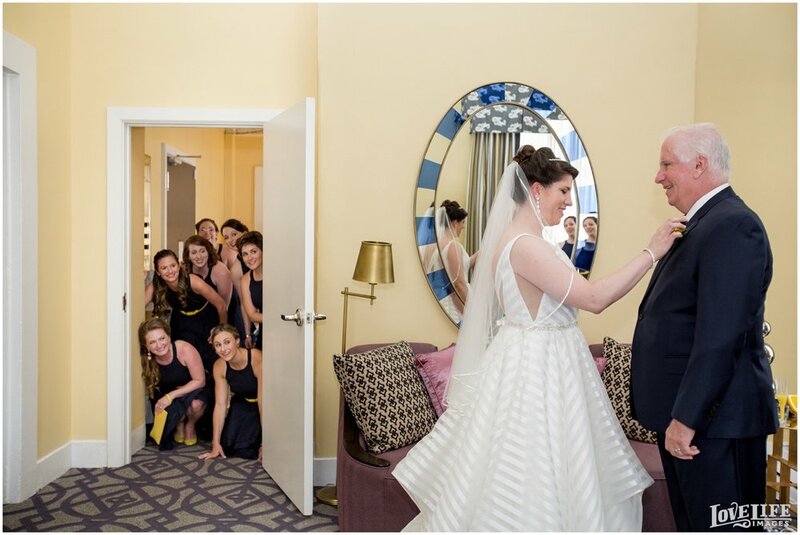 I love how the bridesmaids are all squeezing into the door frame together and that the bride and her dad are oblivious to what is going on. It’s moments like this one that remind me how lucky we are to be one of the few people in the room to document such intimate moments.